The Yankees officially selected Ford's contract from Triple-A Scranton/Wilkes-Barre on Tuesday. New York announced the transaction shortly after George A. King III of the New York Post reported that Ford would receive his first big-league callup. The 26-year-old will assume the active roster spot of first baseman/designated hitter Greg Bird, who was placed on the 10-day injured list after being diagnosed with plantar fasciitis. 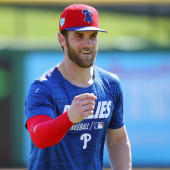 Bird had struggled mightily at the plate prior to getting hurt, so there could be an opportunity for Ford to stick around with the big club even if Bird's absence proves to be only a short-term situation. Ford slashed a modest .251/.326/.433 over 108 games in the minors in 2018 but has been one of the top hitters early on in the International League this season, amassing a 1.364 OPS over his first 45 plate appearances.